The thing is, I just can't eat much of it. Like last Saturday, for instance - I went out for The Pie pizza and guess who only ate one piece before declaring she was so full she was gonna pop? I seriously disappoint myself sometimes. I had such ambitions - four pieces and a cookie from Smart Cookie. I digress. I'm always up for yummy food. 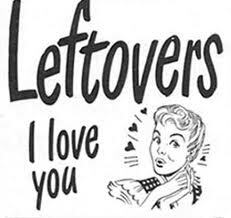 But what to do with the leftovers when I'm not typically a huge leftovers fan? And how many times do I just want a bite or two of a cookie or some other sweet treat, but don't want to waste the rest? This is where a man friend comes into play. Men, you date me, you get to eat wherever you want and get at least half of my meal too. I'm a bargain, fellas! This is very clever personal advertising. Appealing to us always-hungry menfolk! I feel so "in the know". :) Maybe it's something about being with ME that you can only eat one slice...remember Grimaldis? !